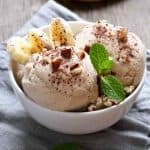 It’s crazy that just one simple ingredient — frozen bananas — can turn something like ice cream healthy. And you don’t need an ice cream maker to make it or any fancy equipment — all you need is a freezer and a food processor/blender. Optional mix-ins: 1/2 cup frozen berries and 1 tbsp peanut butter OR 2 tbsp Pecans + 1/2 tsp cinnamon, the sky's the limit! Place frozen banana chunks in a food processor. Blend until you have coarse crumbs. Add the yogurt and blend 1-2 minutes or until the mixture is smooth and creamy. Add the chocolate and walnuts and pulse a few times until incorporated. Serve immediately, or place in the freezer for 30-60 minutes for a firmer, more ice cream-like consistency.